This has to be the blocked field goal that was returned for a touchdown that stunned and defeated Ohio State, 24-21, in 2016 at Beaver Stadium. Marcus Allen blocked it, and Grant Haley returned it 60 yards for the game-winning score. Other than Todd Blackledge hitting Gregg Garrity with a 47-yard touchdown pass in the 1982 Sugar Bowl, the decisive blow that carried the Nittany Lions to their first national title, and Pete Giftopoulos’ interception that beat Miami for No. 1 in the 1987 Fiesta Bowl, this blocked kick was the most important play in Penn State history. It marked the Lions’ best-ever victory at Beaver Stadium — Ohio State was ranked No. 2 at the time — but as significantly, it breathed hope into a Penn State program that had not yet fully recovered from the Sandusky scandal. For the first time since that fateful day in November of 2011, the Nittany Lions now had a future and not just a past. 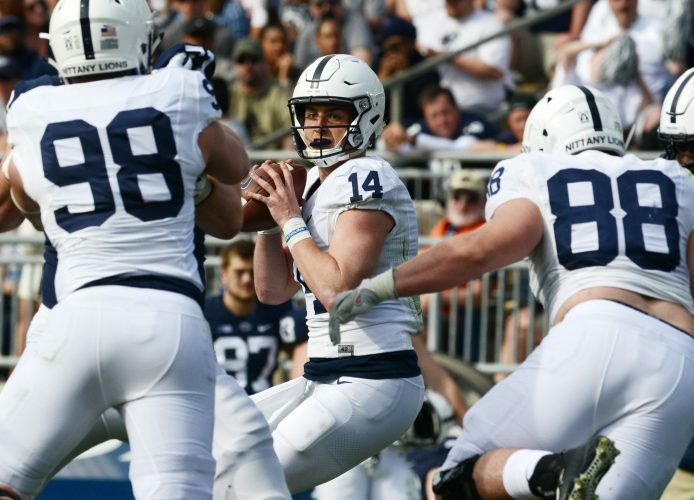 The play validated that James Franklin was capable of leading Penn State to a level that would allow the Lions to think they could compete at the highest level of the Big Ten, and it put them back in the national conversation. The play helped the fans, long suffering from the scandal, finally believe again. Allen and Haley were responsible. Ohio State was lining up for a field goal to extend a 21-17 lead with 4:39 remaining. Allen’s effort, and Haley’s ability to outrun speedy Buckeye holder (and punter) Cameron Johnston showed how giving 100 percent on every play can deliver unexpected results. You just never know when. Allen and Haley proved to be quite the tandem. They also teamed up to make the game-clinching tackle on fourth-and-short that sealed the Lions’ Big Ten championship victory over Wisconsin at Lucas Oil Stadium. Years from now, when the 2016 team is invited back to reunite at Beaver Stadium, there may be players introduced who were better at Penn State and ultimately better in the NFL, but no two will have combined for a more memorable moment than Marcus Allen and Grant Haley.